Regardless of World Ranking, Tiger is currently the best golfer in the world – Tiger’s convincing win at Bay Hill catapulted him to #6 in the Official World Golf Rankings. Why don’t we take a look at whose ahead of him, eh? #5, Steve Stricker – Mr. Consistency in the golf world, Stricker always seems to be in the top-30 on the leader-board on Saturdays and Sundays. Wait a minute, though…how many majors has he won? That’s right, a whopping ZERO. #4, Martin Kaymer – Hailing from Dusseldorf, this determined German came onto the golf scene strong in 2010, winning the PGA Championship and finishing top-10 in the U.S. and British Opens. However, since his big win at Whistling Straits, Kaymer has failed to get into the win column in a PGA Tour sanctioned event. #3, Lee Westwood – I’m just gonna get this off my chest right away – I HATE LEE WESTWOOD. However, I’ll do my best to ignore my biases and render a fair judgment of this doucher; he can sure play some golf. He’s in the same boat as Stricker, having never won a major championship. However, he’s come tantalizingly close to winning all four. Westwood is playing some good golf this year, and he’s had success at Augusta before. If you tell me that Tiger doesn’t win The Masters this year, I’ll put my money here. 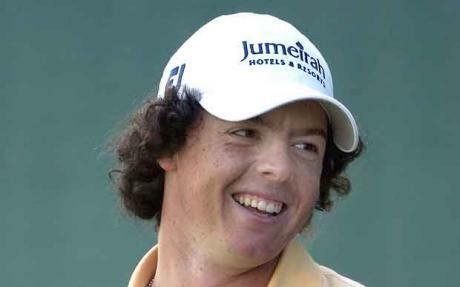 #2, Rory McIlroy – I envy him, but it has nothing to do with his golf skills. I think maybe it has something more to do with Caroline Wozniacki being his current flame. I mean, come on, really?? Either he’s got a lot of confidence in himself, or he’s packin’. For the sake of speculation, I’ll assume it’s more the former. On a serious note, this kid has the chance to be a new generation’s Tiger by dominating golf for years to come, and he believes he can do it; I’m not sold yet. #1, Luke Donald – Is anyone really impressed with this guy? Whenever I watch him play, I find myself wondering how the World Golf Rankings operate, considering they have this man ranked as the best golfer in the world. You show me Luke Donald, and I’ll show you the least intimidating top-20 golfer on tour. The switch to Sean Foley has finally paid off – Anyone else think that it’s ironic that Tiger’s first win on tour since that fateful day in November came on the release week of the book on his own downfall? The name of the book is “The Big Miss,” by former swing coach Hank Haney. I think “The Big Miss” is what Haney is feeling now that Woods demonstrated he is going to be successful in resuscitating his golf career. Tiger’s ball-striking consistency has improved under Foley’s tutelage; it just took him a while to get his putter working. Now he’s put it all together, and the golf world is taking notice. That offers a wonderful segue into the fact that…. Tiger is still intimidating on Sundays – Let’s not kid ourselves; Tiger’s play during the weekend at Bay Hill wasn’t exactly awe-inspiring. He shot a 1-under 71 on Saturday and 2-under 70 on Sunday, carding 5 bogeys in comparison to the whopping 1 bogey he had between Thursday and Friday. I think the more important observation to take away from the weekend is that golfers on tour are still very much intimidated when Tiger heads into Day 4 atop the leaderboard. What big names were in contention going into Sunday at the Arnold Palmer Invitational? How’d they score? Let’s take a look: Graeme McDowell (+2, 74), Ian Poulter (+2, 74), Bubba Watson (E, 72) and Ernie Els (+3, 75). That’s right, ladies and gentleman, the big name players all crumbled under the pressure that emanates from Eldrick’s aura. Tiger is back to stay, and the new odds-on favorite to win at Augusta in April. The rest of the players on tour better grow some cojones if they want to go head-to-head with him in a Sunday duel.